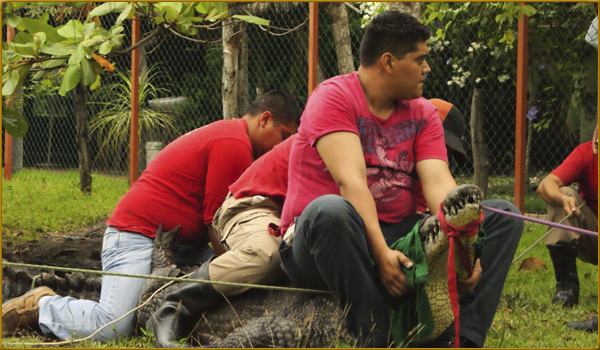 The 3rd Annual Training Workshop For Crocodile and Snake Handling will take place June 12-13, 2015 in San Blas, Nayarit. It will focus on training state public safety and firehouse personnel in dealing with these regional species. The workshop is a joint effort by the Nayarit State Government; the Department of Public Safety and Firefighters; the Ministry of Environment and Natural Resources (Semarnat, by its acronym in Spanish); the Environmental Division of the Federal Attorney’s Office (Profepa, by its Spanish acronym) and the event host, UMA Kiekari. The Riviera Nayarit Convention and Visitors Bureau (CVB) together with Grupo Paradise Village and Grupo Vidanta will also take part in the event as these reptiles are very prevalent in the Destination and proper handling methods are key. Nearly 80 individuals from the Acaponeta, Bahía de Banderas, Compostela, Huajicori, Rosamorada, San Blas, San Pedro Lagunillas, Santiago Ixcuintla, Tecuala, Tepic and Tuxpan public safety departments will be participating. The program will include a variety of theoretical and preventive measures in the humane management of these reptiles, and will address the risks involved when dealing with these species as well as the care that should be offered to citizens that come in contact with them. This is the third time this preventive workshop is taking place; it will touch on several topics including the biology and ecology of the species, management techniques, the transfer and release of specimens, wildlife management protocols (particularly of crocodiles and stranded marine mammals), laws and regulations applicable in wildlife management and the care of poisonous bites/wounds before medical attention arrives. This type of activity unites the three levels of government with private initiative to work towards the greater good, not only for the species in question but also for the citizens at large, the visitors to the destination and the public safety personnel themselves.